Rest on the beach - each puts own meaning in this concept. Someone would like to lie on the sand, enjoy the warm rays of the sun, splash sea waves. And for someone it’s a walk on a yacht or diving under water with scuba. Everything is possible in Azerbaijan, but the main thing is to sunbathe on the beach, wander through the hot sand and take pictures of seascapes. Azerbaijan is the unique case where within a country the majority of the existing climatic zones (9 out of 11) are found: from the dry and humid subtropical to the mountain tundra. In this case, a significant part of the country is in the subtropical belt. So, Baku beaches are in the top of the CIS resorts by popularity among Russians for the summer holidays. The beaches of Baku are included in the rating of the best resorts of the CIS, popular among Russian tourists for summer, Turstat reported. The best resorts of the CIS were composed with sea and on the lake, which included resorts of Kazakhstan, Kyrgyzstan, Belarus, and Azerbaijan. 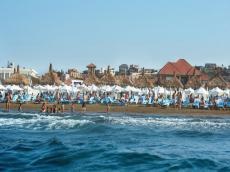 The most popular among Russians for summer holidays are Burabai (Borovoe) resort in Kazakhstan, Lake Issyk-Kul in Kyrgyzstan, Lake Narach in Belarus, and Bilgah beach of Baku on the Caspian Sea coast. The Agency reported that Russian tourists in the resorts of the Commonwealth countries have a summer vacation from a week to two weeks. The daily budget for these resorts ranges from $50 to $100. The Caspian Sea is known as the world’s largest lake and the Azerbaijani coastline extends over 800km, making it a great beach destination. The beach season is underway again; for many this is the end of an impatient wait. To develop this field in the country and attract more tourists, a plan of action for the development of beach tourism in the country was approved in 2017-2020. The decree was signed with the aim of more rational use of the Azerbaijani sector of the Caspian Sea to improve tourism industry. The document sets out 6 main directions of the action plan: improving the legal framework for beach tourism, creating and improving a favorable infrastructure on the beaches, regulating the activities of beach operators, activities provision of security and environmental protection measures, creating a data base on beaches and promoting beach tourism.